Still rocking the bitchin' street art, but lousy with apps. Goodbye, bitchin'street art, hello self-referential Existential Dread Fish. There were a number of factors that led to me looking for a replacement, none more notable than the fact that I'd not had a system update in 2 years and my security updates and support ended not long after that. The camera had become almost completely useless and I'll admit, the lag when opening the phone app did cause me a bit of concern when thinking about the possibility of needing to make an emergency call. But beyond that, the phone functioned pretty damned well for an obsolete device. The battery may not be optimal, but it still lasts me a full day and of the 32 GB of storage I started with, 18 GB remain without having ever performed more than usual disk cleanup. And thanks to decent cases and tempered glass screen protectors, there's not a scratch, dent, or ding to be found on the body of the device. All of which takes away considerably from the elation I should be experiencing from the purchase of a new phone. Before I get into the specifics of why, let me at least tell you a bit about what I *do* love about the Nokia 7.1, beginning with a major positive: this is an unlocked, stock Android mid-range phone with decent price point. The Nexus was not unlocked, meaning that if I'd decided a year into owning what was a rather pricey phone (retail was $699 on my model at the time) that I wanted to switch carriers, I would have needed to buy a new phone. The Nexus was, however, stock Android, or pure Android, which was something I got very used to. While some people consider this a "stripped down" version because neither carrier nor manufacturers can add their own skins or apps to the interface, I consider it a godsend because bloatware was what typically caused all of my previous phones to run slow or run out of space quickly. 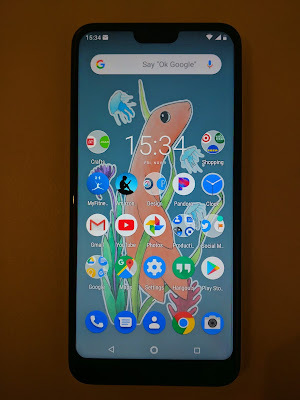 Earlier this year when I first realized a new phone was inevitably in my near future, I'd basically accepted that I was stuck with a Pixel, aka: Google's very expensive flagship phone, because I didn't want to go back to using something with a lot of unnecessary add-ons. Luckily, Google decided to bring Android One to the States, meaning now there are several manufacturers offering pure Android phones ranging from extremely affordable to high end. 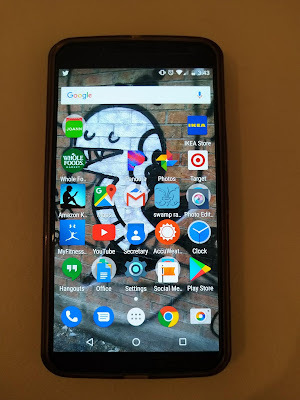 The Nokia 7.1 cost me $349 on Amazon. Literally half the cost of my Nexus 6 with twice the memory (4 GB vs 2 GB) and disk space (64 GB vs 32GB). I love this because it opens up the world of stock operating systems up to those who can't afford a high end phone. Not only that, but all Android One phones, regardless of price, have the guarantee of at least two years system updates and three years security updates (I go into detail about why this is problematic later, but for now, lets call it a good thing given that a similarly priced new phone without Android One may never get an update). Unfortunately, because the Nokia is a mid-range competing with the flagships, it's also a long, skinny phone and I'm not sure how I feel about that. The Nexus boasted a 6" screen whereas the Nokia is 5.84". You wouldn't think there would be a lot of difference, but there is. The Nexus screen was about 3.25" wide and 5.25" long. The Nokia has a 2.65" width and the same 5.25" length. I'm a large human with large hands, so getting used to what now feels like a toy phone is not easy. Honestly, this isn't a phone review, but from the few days I've been using the Nokia 7.1, I would give it high marks. The only drawback for me is the tiny (to me) size thanks to the now standard aspect ratio of 9:19 and the fact that the phone is made entirely of glass. Even with a TPU case, I'm treating this thing like a spun sugar snowflake. Perhaps if Otterbox decides to come out with something substantial, I'll feel a bit better, but given that they didn't case the Nexus 6, I'm not holding my breath. So what's the problem? Well, as I said, aside from some slow functionality and zero software support, the Nexus 6 is still a well-running machine that might have lived on for another 2-4 years with proper system updates and some user-level hardware upgrade capabilities. I held off for as long as I could, but a new device was necessary, and the fact that the only reason my old one isn't already adding to our e-waste problem is because I refuse to recycle anything that has personal data on it and therefore have a ridiculously huge collection of outdated tech gathering dust, is a HUGE problem. I get it. I like the idea of having the latest and greatest as much as the next guy, but why does the latest and greatest have to come out every few months? Why do we allow companies to plan the death of these devices, adding to the monumental environmental disaster that is consumerism without some sort of push-back? I get that they do this to force people to buy new devices because that's how they make money, but come on! You can easily make money off upgrading existing devices as well. Think about it. Even if camera hardware and phone receivers could be swapped and upgraded, the average Jo (including me) would probably not have the know-how or resources to do so ourselves, so we'd happily take our older devices to an authorized repair facility and PAY SOMEONE for the upgrades. And seriously, who made the decisions that batteries should be inaccessible and unreplaceable? Batteries used to be the EASIEST thing to replace in older phones. Sometimes so easy that they would fly out if the phone was dropped a certain way (I'm looking at you, Palm Centro). As for not offering support or updates on older devices? That's simply irresponsible. Operating System updates should be available for all devices with the hardware required to run them (and hardware updates should be available to those who want them). Hell, I'd even pay a small fee for an upgrade on an older device if it meant I could have the latest upgrades and security patches. By now you all know me as a forward thinking future-tech junkie. Which is why the fact that I pine for the good old days of DIY desktops cobbled together from whatever friends were throwing away is just wrong. Not only because I hold in my hand the power of 12 of those computers combined, but because we should be progressing forward, not back. Which is why the Nexus 6 is now going to be my lab rat. I intend to go from fan of tech that I might not have completely understood to tech-savvy specialist, capable of rooting, unlocking, and flashing my device like a pro. If I can start to understand the basics, it's possible I might also delve deeper and see if I can possibly replace the blown motherboard on my Nexus 7 tablet, which has been sitting at the bottom of my broken tech pile for almost 3 years now. I highly doubt anyone of any importance will come across this post and suddenly decree that all phones going forward must be environmentally friendly, but perhaps if we all made a conscious effort to think twice before adding to the e-waste mountain, our individually small gestures might make an impact.